White vertical bollards separating pedestrians from vehicles; vibrant blue paint delineating pedestrian zones; crosswalks where pedestrians frequently cross the streets. All quick-to-build, inexpensive improvements alerting drivers to the presence of people walking, persuading them to slow down. A community vision turned into reality – at least for the short-term – these improvements will serve the “Little Kurdistan” neighborhood of Nashville, home of The Salahadeen Center of Nashville (a mosque and community center), four Middle Eastern food markets, several restaurants serving delicious Iraqi, Kurdish, Turkish and Asian dishes, several other businesses and residences. Nashville and Tennessee leaders will need to decide whether or not to make these improvements permanent. Their decisions will be based on data. 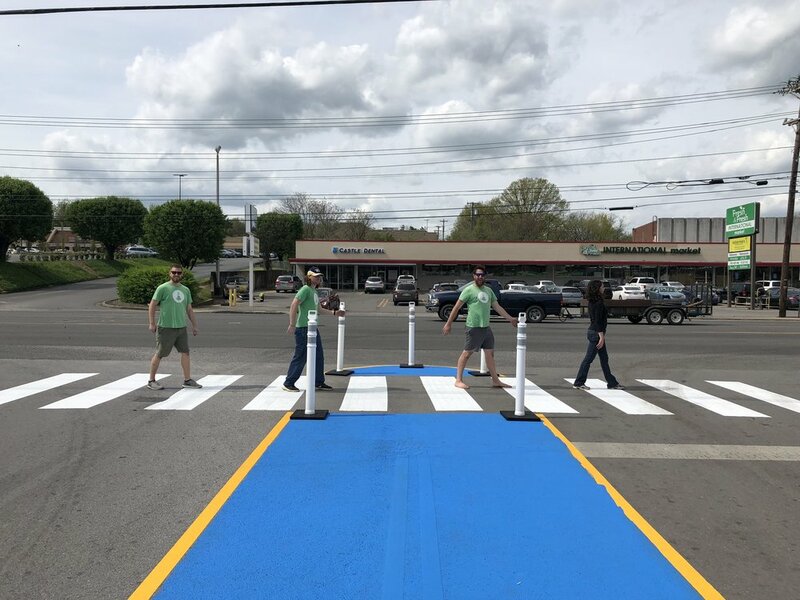 Envision Nolensville Pike Collaborative (ENPC) staff and 16 Metro Nashville high school students are collecting and analyzing data over the next four weeks to demonstrate the impact and efficacy of the walking safety improvements. They will present their findings to city and state leaders and publish the results in a research paper. Staff of TURBO Nashville (part of the Reclaiming Public Space initiative of the Nashville Civic Design Center (NCDC)) designed the project based on guidance from ENPC leaders and community members and worked with Metro Public Works and Planning staff to approve the “quick build” installation. Staff from The Salahadeen Center and Conexión Américas, who lead ENPC, have hosted conversations and events that produced the vision for the walking improvements since 2015. Conexión Américas secured funding for the project from Metro Public Health. “Envision Nolensville Pike” is currently funded by ArtPlace America and has received funding from the Kresge Foundation in the past. Community members and ENPC leadership envisioned the walking path based on years of visiting, working in and living in the area. One pivotal community event, in particular, inspired the path. In 2018, staff from The Salahadeen Center, Conexión Américas, NCDC and the Greater Nashville Regional Council led a “Design Your Neighborhood” internship with eleven Metro Nashville high school students and one elementary school student. The students recommended improvements for the Little Kurdistan area and even designed and built several projects including three artistic crosswalks, an outdoor table and benches and a landscaped storefront during the short three-week internship. Other ideas, such as sidewalks and walking paths throughout the area, needed more time to design and approve. Over the next year, ENPC leadership and NCDC staff worked to design the project, negotiated with business owners and community members, obtained the necessary permit and, on the morning of April 11th, 2019, built the walking safety improvements in five hours. Feedback on the improvements has been overwhelmingly positive. 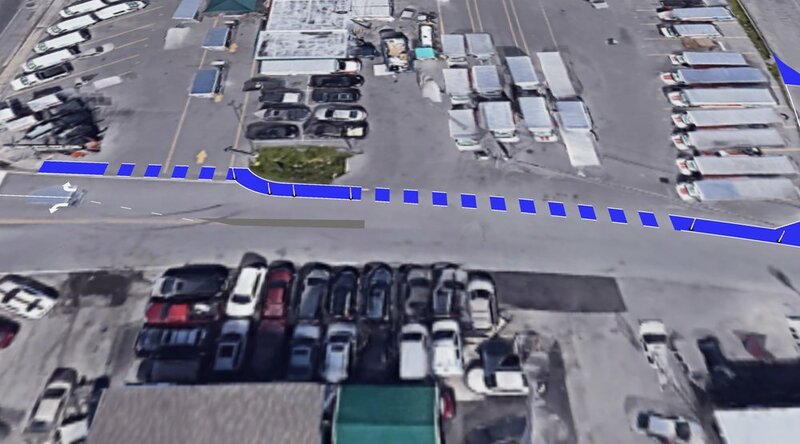 Two business owners who were previously wary of the idea of bright blue paint in the parking lot adjacent to their business, in the end, asked for the paint and bollards after they witnessed the improvements being made near the U-Haul. Several passersby – transit riders going to work, customers of the Mazi, Azadi, Newroz and Al Rasoul markets, students walking home from school – voiced their enthusiasm for the installation and commented on the need for this and other pedestrian safety projects. Noticeably, vehicles already seem to be traveling through the area at slower speeds. ENPC staff and high school interns will track any changes in the numbers of people walking or bicycling in the area over the next four weeks by counting pedestrians and bicyclists three days a week. “It is critical to make it safer to walk and travel via all modes of transportation in Nashville. Nolensville Pike is one of the most dangerous roads for walking in Tennessee – and even the country. Despite the low cost of pedestrian safety improvements, infrastructure to make walking safer lags far behind the need. Community members and civic leaders designed and built the Elysian Fields Road walking path in partnership with government agencies, taking a ‘do it yourself’ approach buoyed by the support, ideas and inspiration from countless community members over the years,” said Rochelle Carpenter, a leader of the Envision Nolensville Pike Collaborative. 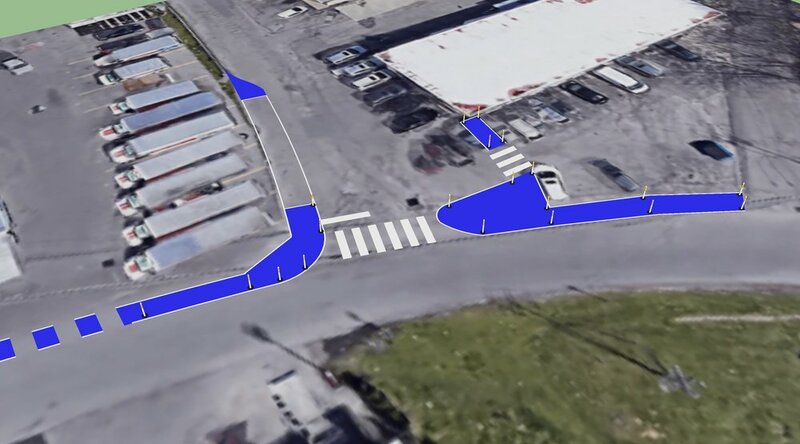 The Nolensville active transportation safety improvements builds upon Envision Nolensville Pike, and continues the work of the Nashville Civic Design Center’s Design Your Neighborhood student TURBO (sTURBO) program. sTURBO is a youth-centered, community-based participatory research initiative in which youth are designing, conducting, and analyzing research on walking and bicycling issues on Nolensville Pike. Through this program, 16 young community members recruited and hosted by Conexión Américas and the Salahadeen Center are collaborating with Vanderbilt researchers to investigate infrastructural insufficiencies that hinder on-foot and bicycle transportation in their community. After the infrastructure improvements have been installed, the youth research team will collect additional data to assess their impact. With the support of the Greater Nashville Regional Council (GNRC), the research findings will inform recommendations for permanent infrastructural changes, which will be presented to government representatives that will work to implement these recommendations. The youth research team will present their findings and recommendations in a paper and a presentation delivered to the representatives and their community in the form of a public forum. TURBO is using temporary materials to experiment with a pedestrian buffer that will help research students collect data and analyze the space.